A long time ago (circa 1969), in a far away place (Miami, Florida) a young assistant professor of Neurology began his studies of the ocular motor system at the Miami VA Medical Center. Shortly thereafter (circa 1970) he was joined in that research endeavor by an even younger assistant professor of biomedical engineering. Robert B. Daroff and Louis F. Dell'Osso established the first formal interdisciplinary (neurology and biomedical engineering) collaboration aimed at understanding both normal and abnormal ocular motor system function. They began to build an ocular motility laboratory at the VA and named it "The Ocular Motor Neurophysiology Laboratory," a name that appeared on the title pages of hundreds of research publications in the ensuing five decades. Thanks to a generous endowment pledge by Dr. Daroff, the laboratory was given the new name above. The underlying research philosophy resulting from this unique synergy of medical and engineering science was that the goal of understanding ocular motor function could best be elucidated through a control systems approach guided by neurophysiological knowledge. Where the latter was lacking, reasonable functional hypotheses would be used in computer models of the various subsystems under study. A key advantage of this approach was the ability to study ocular motor dysfunction (i.e., "experiments of nature") in order to elucidate not only the mechanism of each dysfunction but also how the normal ocular motor system functions and uses its various subsystems to overcome each type of dysfunction. This combining of the "normal" and the "abnormal" along with the "basic" and the "clinical" has proved to be a powerful approach and has demonstrated that these artificial distinctions were an impediment to ocular motor research. By design, OMLAB research has been conducted with the dual aims of elucidating function and dysfunction and applying our results clinically in diagnosing and treating ocular motor abnormalities. The many diagnostic criteria and therapeutic applications (especially the development of an entirely new type of extraocular muscle surgery, the four-muscle tenotomy) emanating from OMLAB, attest to the success of this approach. Since the early 1970's, this laboratory served as a prototype for subsequent interdisciplinary groups who began studying ocular motility and has achieved international recognition as the source of cutting-edge ocular motor research; it has also received the generous support of the Department of Veterans Affairs for over five decades. 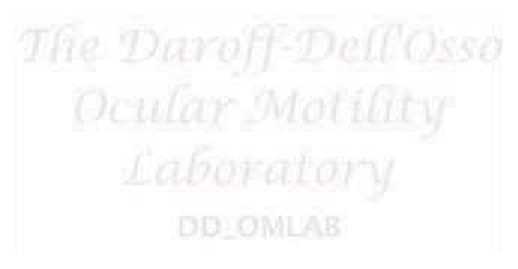 The Daroff-Dell'Osso Ocular Motility Laboratory (OMLAB) remained at the Miami VA Medical Center throughout the 1970's. As part of a collaborative research effort with investigators from the Bascom Palmer Eye Institute, Fellows (MD and PhD) were trained in ocular motor research. Two, Drs. B. Todd Troost and Larry A. Abel, rejoined OMLAB in 1980 when Drs. Daroff and Dell'Osso were recruited by Case Western Reserve University. As part of their relocation, OMLAB was moved to the Louis Stokes Cleveland VA Medical Center, where it resides today. In the early 1990's, Drs. Dell'Osso and Jacobs designed and constructed the Canine Ocular Motility Laboratory (COMLAB) in order to collaborate with Dr. Robert Williams in Memphis, Tennessee in studying the ocular motility of achiasmatic Belgian sheepdogs. A decade later COMLAB was moved to Philadelphia, Pennsylvania in order to collaborate with Dr. Jean Bennett in studying the ocular motility of RPE65-deficient Briard dogs. In 2012, COMLAB was mved to Akron, Ohio to collaborate with Dr. Richard Hertle on using a Briard dog form the Philadelphis colony to evaluate the safety and efficacy of chemical eye drops to treat human INS. 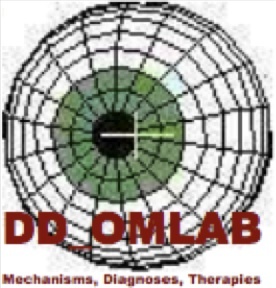 A quick glance at the Personnel page shows the many students, fellows, and visiting scientists who have studied ocular motility at OMLAB and the other distinguished scientists who have joined as principal and co-investigators, each bringing their own unique area of ocular motor expertise and allowing even greater interdisciplinary collaboration. As in the past, investigators from OMLAB continue to engage in collaborative research with investigators from other laboratories throughout the world. In addition to the hypotheses that emerged from our research, we have also: attempted to introduce terminology that is both accurate and based on mechanism; defined diagnostic criteria for many types of nystagmus and saccadic oscillations; developed analysis methods including a mathematical function, the NAFX, that estimates best-corrected potential visual acuity in patients with nystagmus; and developed and demonstrated therapies for different types of nystagmus. *** Come and browse our new lab space!.